Dank je wel for everything Nederland. Goodbye! Guest blogger Hannah Foster spent a year studying in the Netherlands at Leiden University. This is her last blog post for The Leidener. “Wilt u een bon?” “Nee hoor, dank je wel.” There is nothing quite like the satisfaction of navigating a grocery store in a foreign language. I would take my three euro tulips, 99 cent baguette, and various fruits and veggies, shove them in my bike bags, and cycle home. Each visit to the local Albert Heijn grocery store was a very Dutch experience, one that I find myself missing dearly after what has been been over three months since I left the Netherlands. The Dutch are the tallest people in the world, and are often considered rude for their direct mannerisms. The Netherlands, particularly Holland, is one of the most densely populated countries, to the point where they reclaimed land from the water in order to create more living space. There are more bikes and cows than people. It’s illegal to bike without lights at night, and you need to be careful when biking amidst tram tracks. The tall, direct, brown-shoe wearing, and charmingly frugal Dutch are some of the nicest people in the world when you get to know them. Tulip season, fields upon fields of colored blooms neatly arranged in rows, will take your breath away. Nothing compares to the feeling of biking to the beach on a sunny spring day, except maybe putting your foot in the chilly North Sea. Dutch cheese may very well change your life. If you’ve talked to me recently you’ve probably noticed I won’t shut up about Leiden and The Hague. The year I spent in the Netherlands taught me about a new culture and language, but it also taught me countless lessons about life and how to navigate a new place. I learned how to live on my own, cooking full meals using essentially only a mini fridge, hot plate, and wok. I learned how to bike in any sort of weather, from sideways rain and high winds to idyllic spring days without a cloud in the sky. I learned what market stalls had the best giant stroopwaffels for the lowest prices. I tackled the Dutch language wholeheartedly, quickly peppering my sentences with lekker, leuk, and gezellig. I learned how to take pleasure in ordinary things, enjoying a fresh jus d’orange on a terrace or a simple stroll along the canals. Beauty, it seemed, was in everything. The first time I took a Dutch train I spent the entire 35-minute journey from Amsterdam to Leiden wondering what the heck I was doing here, and if the train was even going in the right direction. The incredibly flat scenery out the window seemed to roll by endlessly underneath what I would soon recognize as a characteristically Dutch grey sky. I was alone. I was scared. I had no idea what to expect. The train, as it turned out, was going in the right direction, but I arrived to Leiden still feeling just as lost, but slightly more confident in my train navigating ability. I spent a lot of time on the trains in the Netherlands, making the three-hour trek down to Maastricht, and the three-hour trek up to Groningen, trying to see as much of the country as possible. In my second semester, I rode the trains between Leiden and The Hague at least three times a week to attend lectures and workgroups. I came to value the time I spent with NS, each ride a small break from the hustle of everyday life. One of the final items on my Dutch bucket list was to ride in first class, experiencing how the other half lived, and I did so for my very last train trip from Leiden to The Hague. That trip, and to be very honest, almost every trip, I remembered how unsure and scared I was back in January, and couldn’t help but smile at how, like trains, people end up where they need to be. Perhaps most notably, the Netherlands taught me how to be happier and revel in joy. It was an amazing year in all the ways possible. My first semester orientation group consisted of amazing, international people, our core friend group consisting of people from Scotland, Finland, and America. We enjoyed nights out, nights in, beach days, and drinks. We studied all different things but bonded over our love for frites met mayo and exploring our new home. I’ll remain forever grateful for Wednesday nights at Einstein’s, late night patat doner, and countless rounds of cards/ cups played. When I wasn’t surrounded by such joy in the Netherlands, I traveled around Europe with my best friends from home and from Holland: eating croissants in Paris, sunbathing on the beaches of Barcelona, visiting museums in Vienna. Schiphol Airport became somewhat of a home base, I knew that the restaurant Dutch and Delicious would always be waiting for me upon my return. I also studied during study abroad, although the photos may not seem like it. I took classes in Dutch culture and now know way too much about Piet Mondrian and Dutch design. I can sing almost all of the Wilhelmus. I fell in love with the quirky Dutch culture, the krokets and bathroom calendars and gourmetten, all of it. Sometimes I wanted to throw my bike into the canal and never look back. One time my bike was stolen and I didn’t even have a bike to throw. Classes were challenging. I wrestled with the Dutch language. Everyone from cashiers to old ladies laughed at my feeble Dutch attempts at least once. I struggled with shyness and sense of self while abroad, but the result of all these challenges was me becoming comfortable with who I am, learning to take opportunities to talk to strangers and put myself out there for new experiences. Even with a sense of self, I still struggled. That’s part of life too. I fell in love and eight months later had my heart broken. I fell off my bike. I visited the Dutch doctor at 3 am. My bike was stolen. Mice got into my apartment. Perhaps the hardest of it all, I had to go home. It was hard to say I was going home, when I was leaving a place that I already considered home. I left the Netherlands, my new homes in Leiden and The Hague, with a heart incredibly full of gratitude. Everyone that made my time there the crazy beautiful experience that it was, every birthday party where I was made to feel like family, every friend I made while knapping flint in archaeology class, every kind Dutch person who helped me with a flat tire, everything that brought me great joy– I am so thankful for these little moments and interactions and will carry them with me always. My second to last day in the Netherlands I found myself in a tattoo shop around the corner from my apartment in The Hague, getting a final memento of my time in the tiny country. A tulip on my left ankle, a reminder of not only the beautiful tulip fields but also the three euro tulips from the Albert Heijn across the street that I would buy just because they made me happy. Three kisses to you Nederland, and dank je wel for everything. 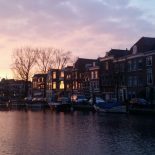 This entry was posted on March 13, 2018 by admin@theleidener in Authors, Guest Blogger and tagged bachelors, community, Dutch, friends, fun, holland, International, international education, international student, leiden, leiden university, netherlands, new experiences, study abroad, the netherlands, travel.